All the classic flavors of peanut butter and jelly are baked into a festive thumbprint cookies. These PBJ Thumbprint Cookies are perfect for Christmas! This is not just any Christmas thumbprint cookie recipe. This recipes is part of The Sweetest Season Cookie Exchange! Over 60 bloggers and I are sharing some of our favorite Christmas cookie recipes to get you in the holiday spirit. And, in the spirit of the season, we are also bringing you The Sweetest Season’s Sweetest Cookie Giveaway! 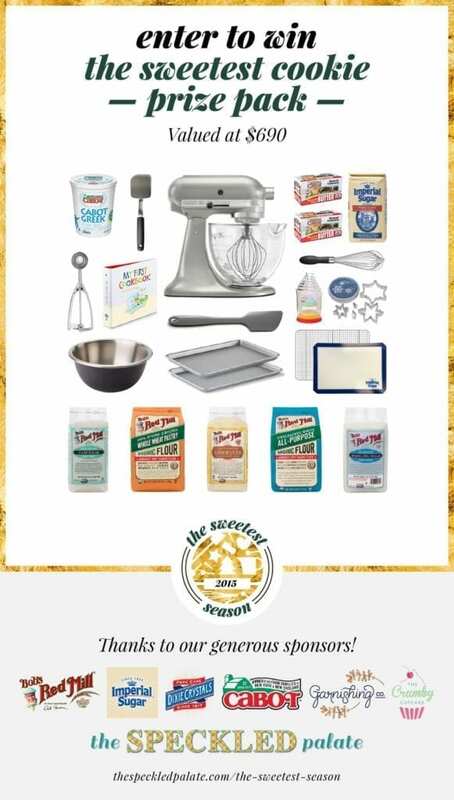 We’ve put together an incredible cookie baking prize package, worth over $600, including a KITCHEN-AID STAND MIXER!! Scroll to the bottom of the post for more details! I would love one of you to win this awesome prize! And now, let’s talk a little bit more about these PBJ Thumbprint Cookies! I love making thumbprint cookies around Christmas. There is something so festive about them. And my favorite variety is a peanut butter thumbprint cookie! Because, in case you didn’t know, we love peanut butter around my house! These PBJ Thumbprint Cookies are nearly identical to the Peanut Butter Blossoms I made last year with two changes – one, I used jelly instead of chocolate and two, I used granulated sugar instead of colored sugar. Is it cheating to essentially make the same recipe two years in a row? Maybe, but I couldn’t help myself because we loved these so much last year! The cookie is super soft and full of peanut butter flavor, and they couldn’t be easier to make. I add the jam to the cookies after they have baked. I tried it both ways, but I think the cookie looks prettier when the jam is added after the baking rather than before. In the bowl of a stand mixer fitted with the paddle attachment, beat butter and peanut butter until well combined. Add the 1/3 cup granulated sugar and brown sugar and beat until light and fluffy. Add egg, milk and vanilla and beat well. Slowly pour the flour mixture into the peanut butter mixture and mix until combined. Cover the bowl with plastic wrap and chill the dough until firm, about 1 hour (or up to 48 hours). Bake cookies for 8 to 10 minutes or until lightly browned. Remove from oven and immediately use the back of a small teaspoon measure or the handle of a wooden spoon to make an indent (a "thumbprint" in the center of each cookie; cookie will crack around edges. Fill each indent with about a teaspoon of jelly. Transfer cookies to a wire rack to cool completely. And now, on to the GIVEAWAY! Hooray!!! Be sure to check out all of these awesome blogs to see the amazing cookie recipes everyone has made! 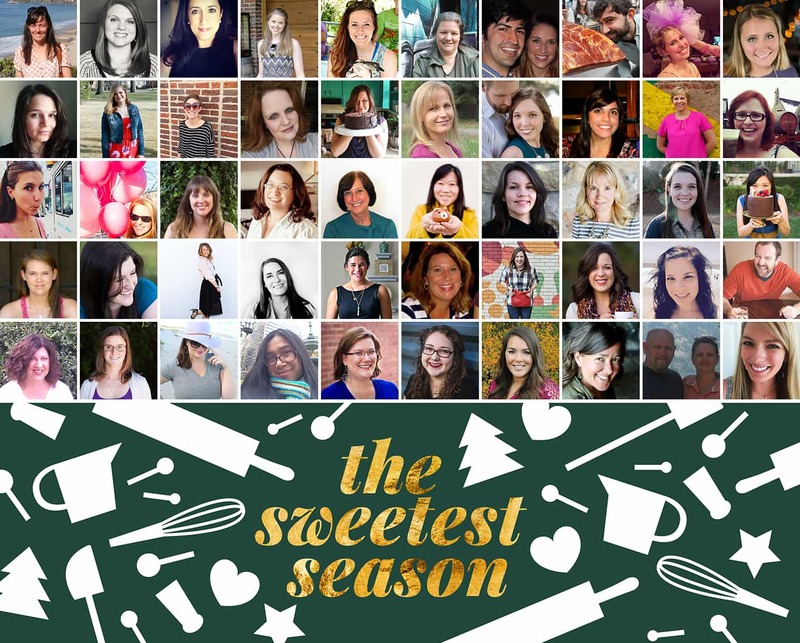 We’re using the hashtag #sweetestseasoncookies on social media this week if you want to follow along! I made thumbprints this weekend! They’re going up on the blog tomorrow! I love your idea of using peanut butter cookies– so good! Love me some PB&J. Great idea, Cate! I just made my first thumbprint cookies. They are so much fun! I bet a peanut butter version is phenomenal! These cookies are darling Cate! And I love anything PB&J!